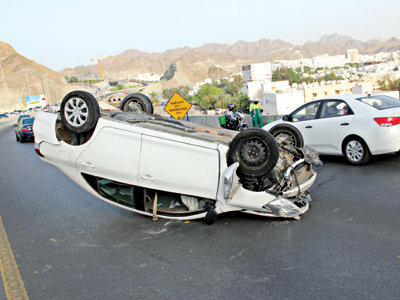 Oman registers 22% drop in road accident deaths « Being The Safe Driver! Behind The Wheel! About The Website, Aciidents Victims Stories, Articles by Others, Behind The Wheel!, Being The Safe Driver!, Breaking News!, Nice Article, Road Safety Articles, Road Safety Book, The New Road Safety Book! Road safety appears to have improved in Oman, with a significant dip in deaths and injuries caused by accidents from January to October this year compared to the same period in 2012. “Deaths from accidents have fallen 22 per cent, the injuries rate is down by 13 per cent and the incident rate is lesser by seven per cent,” an official source from the ROP said. Attributing this drop to sustained awareness efforts over the past three to four years, experts say a national strategy and more road safety laws are now on the anvil. He said that once the National Strategy on Road Safety 2011-2020 is introduced, ‘things will improve further since all the various authorities will just have to follow it’. Comments on the national strategy were reviewed at a recent meeting of the National Committee for Road Safety chaired by Lt Gen Hassan bin Mohsin al Shuraiqi, Inspector General of Police and Customs. “The committee also discussed the report of the British Transport Research Laboratory on aspects of traffic safety in Oman,” the ROP source said. A World Health Organization’s Global status report on road safety in 2013 says that the younger age groups are the hardest hit in accidents. “About 60 per cent of those killed in road crashes are between the ages of 15 and 44 years, and over 75 per cent are male. This is in line with the updated Global Burden of Disease Data 2010, which shows that road accidents are the leading cause of death among those aged 15-29 years in this (Eastern Mediterranean) region,” it says. This report serves as a baseline for the Decade of Action for Road Safety 2011-2020, declared by the UN General Assembly, and says that the number of road accident deaths globally remains unacceptably high at 1.24mn per year. “Only 28 countries, covering seven per cent of the world’s population, have comprehensive road safety laws on five key risk factors – drinking and driving, speeding and failing to use motorcycle helmets, seat belts and child restraints,” the report says.